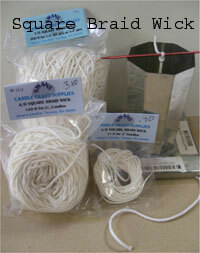 Square braid wick is bleached cotton wick that is commonly used for molded/pillar candles & dipping tapers and usable for many differnet waxes such as paraffin, soy, palm, beeswax and vegetable wax. Square braid wick will slighty curl as it burns. You should always trim your wick every few hours and before re lighting. We recommend testing your wicks before making a bunch of candles to be sure you are using the right size wick. Wick bars are for holding the wick center while container candle cools. Safety Wick Tab Supports 15mm x 9mm neck Extra long neck for Safety. Standard 20mm wick tab supports. Fits most wick sizes. Best way to recycle your leftover wick clippings!